Are Wetsuits Burkas for Cold-Water Surfer Girls? “You miss 100 percent of the shots you never take.” –Wayne Gretzky. Gretzky may have been a hockey player, but his quote about scoring goals is true in any sport–including soccer. A lot of students in our EduKick soccer camps and boarding schools start out with hesitation to shoot. We teach them take advantage of every opportunity. If you never shoot, you’ll never score. Observe the goalkeeper’s position. Have they left a gap that you can exploit? Select the best technique for your shot. A sidefoot shot will have greater accuracy, but an instep (laces) with good follow-through will have greater power. Put your non-kicking foot alongside the ball. Keep your head down and your eyes on the ball when striking. Keep your body over the ball. Make contact with the middle to top half of the ball. Shoot wide rather than high. There’s a better chance of getting a deflection that will wrong-foot the goalkeeper. Shoot low. It’s harder for a keeper to reach shots along the ground because it’s further for them to travel. It’s easy for them to jump up and save, but much harder to crouch down and get it. Shoot across the keeper. It’s tougher for them to hold these shots, and means they could divert the ball back into the path of another attacker. Where Are the Most Shots Made? Ever wondered if there’s actually a “sweet spot” in a soccer goal? A place where you could kick the ball and it would go in almost every time? Ouch. As you can see, shooting high means you have a pretty low percentage of actually scoring. While you have a better chance of scoring if you shoot to the middle than up high, the odds still aren’t much in your favor. Look at these stats: 62 percent of all goals were scored low. This makes sense because it is very difficult for goalkeepers, especially tall ones, to get down to the ground. It’s much easier and more natural for them to jump high. Also, looking at the statistics, 67 percent of goals were scored in the corners versus 33 percent down the middle. If you combine the two statistics and shoot low into the corner, you should have a much greater success rate in scoring goals. 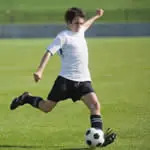 As with any soccer technique, you need to practice if you want to improve your shooting skills. Fortunately, the techniques used for shooting are similar to those used for passing. So you can build up two vital soccer techniques at the same time. But most importantly: If you see the goal, shoot! This one piece of advice is important enough to reiterate: You miss 100 percent of the shots you never take. If you see an opportunity to shoot, take it! The only way these tips can help you is if you implement them, both in practice and in games. Seeking Information About Football? You Need To Read This Short Article!